John Robert Fowles was born March 31, 1926 in Leigh-on-Sea, a small town about 40 miles from London in the county of Essex, England. He recalls the English suburban culture of the 1930s as oppressively conformist and his family life as intensely conventional. Of his childhood, Fowles says "I have tried to escape ever since." Fowles attended Bedford School, a large boarding school designed to prepare boys for university, from ages 13 to 18. After briefly attending the University of Edinburgh, Fowles began compulsory military service in 1945 with training at Dartmoor, where he spent the next two years. World War II ended shortly after his training began so Fowles never came near combat, and by 1947 he decided that the military life was not for him. The time spent in Greece was of great importance to Fowles. During his tenure on the island he began to write poetry and to overcome a long-time repression about writing. Between 1952 and 1960 he wrote several novels but offered none to a publisher, considering them all incomplete and too lengthy. In 1965, Fowles' third novel, The Magus--drafts of which he had worked on for over a decade-- was published. Among the seven novels that Fowles has written,The Magus has perhaps generated the most enduring interest and has become something of a cult novel, particularly in the U.S. The most commercially successful of Fowles' novels was The French Lieutenant's Woman, which appeared in 1969. The novel was the winner of several awards and was eventually made into a well-received film starring Meryl Streep in the title role; it is the book that today's casual readers most associate with Fowles. In the 1970s, Fowles worked on a variety of literary projects--including a series of essays on nature--and in 1973 he published a collection of poetry, Poems. He also worked on translations from the French, including adaptations of Cinderella and the novella Ourika. His translation of Marie de France's 12th Century story Eliduc served as an inspiration for The Ebony Tower, a novella and four short stories that appeared in 1974. Fowles also wrote a variety of non-fiction pieces including many essays, reviews, and forwards/afterwords to other writers' novels. He wrote the text for several photographic compilations. Since 1968, Fowles lived on the southern coast of England in the small harbor town of Lyme Regis (the setting for The French Lieutenant's Woman). His interest in the town's local history resulted in his appointment as curator of the Lyme Regis Museum in 1979, a position he filled for a decade. The first comprehensive biography on Fowles, John Fowles--A Life in Two Worlds, was published in 2004, and the first volume of his journals appeared the same year (followed recently by volume two). John Fowles died on November 5, 2005 after a long illness. Fowles was inspired by the Greek philosopher Heraclitus' ideas about mankind's division into two classes: the moral and intellectual elite (aristoi) and the unthinking, conforming mass (hoi palloi). The novel explores how people hold this division within themselves, and urges readers to accept that society will never right the class and intellectual divisions until the aristoi recognize their state of responsibility--rather than superiority--to the masses. A collection of several hundred philosophical thoughts and musings on art, human nature and other subjects. It was revised and republished, without the subtitle, in 1968 and 1970. Chosen as one of the best English-language novels from 1924 to 2005, this work resembles a Victorian novel in structure and detail while pushing the traditional boundaries of narrative in a very modern manner. The book was inspired by the 1823 novel Ourika by Claire de Duras, which Fowles translated into English in 1977. A collection of his poetry, written over several years. A collection of five novellas with interlacing themes, wherein the order of each story is carefully selected to underpin and inform the reading of both the story preceding and following it. Fowles wrote the text for this book of photographs by four generations of The Gibsons of Scilly, who toured the Scilly Isles and West Cornwall taking pictures of ships wrecked from the 1860's and onwards. A somewhat autobiographical bildungsroman following the life of a screenwriter, written in both first and third person voices. The author stated that the book is concerned with "Englishness--what it is like to be English in the late 20th century." Fowles penned the text for this collection of photographs of the Isles of Scilly at the end of Cornwall's foot in the Atlantic. An autobiographical book in which Fowles discusses the essence of nature and its relation to the arts. Fowles wrote the text for this collection of photographs taken at Stonehenge by photographer Barry Brukoff. Exactly as the name suggests, this work is a brief history of the area in which John Fowles lived, worked, and set some of his stories. A fable about a novelist's struggle with his muse, presented as a dialogue within the writer's mind after he wakens an amnesiac in a hospital bed. An 18th century mystery which combines science fiction and history. The use of the word "maggot" is archaic, meaning a "whim" or "obsession." The novel takes place between May 1736 and February 1737 in England. Fowles wrote the text for this collection of dynamic photographic landscapes, as captured by Faye Goodwin. A collection of photographs from the Lyme Regis area, the setting of his novel, The French Lieutenant's Woman. The essays were written between the 1960's and 1998, and cover a range of topics including the autobiographical, philosophical, and literary criticism. This volume begins in 1949, when Fowles was a young man studying French at Oxford. It covers his life through 1965 and the adaptation of his first published work, The Collector, into a movie. The final volume follows Fowles' life from 1965 through 1990, and is offers a look at the struggles and rewards of his career, at the same time revealing a "reluctant celebrity" behind his success. 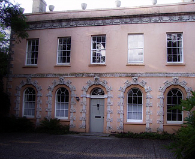 This eighteenth-century villa called Belmont, located in Lyme Regis, was home to the late John Fowles since 1969. Two hundred years earlier, it was the seaside villa of Mrs Eleanor Coade (1733-1821). Just recently, The Landmark Trust has done a complete remodel of the estate and it will be used for, among other things, a center for writers. Learn more about the Belmont House and the Landmark Trust by visiting this site.